We finished homeschooling first grade! Yay! It was definitely a struggle at times but overall I know I made the right choice in choosing to homeschool Grade 1. Today I’m going to share my answers to some of the common questions I’ve been asked by other mothers who were considering homeschooling their child for first grade. Grade 1 students will not have the attention span to sit for a whole day doing book work. As a general estimate, I would say an average of 2 – 3 hours is the max book work my 6 year old would comfortably do in a day, with breaks between subjects. I could squeeze in extra learning comfortably if it was art, music, dance…lighter fun subjects. However, keep in mind, that you will most probably spend more time planning, preparing, teaching, and actively helping your first grader with their work than your child will spend actually doing their school work. First graders need a lot of parent interaction. Even if they know how to do their work and technically could work independently on an assignment without you, they won’t want to. They might stop after each question to proudly show you their work, and will many times need you to tell them: “Ok now do the next question.” As they’re still learning to read, you will also need to be available to read or help them to read all directions. My suggestion: Cut some time by planning out your year in advance. However, you’re probably going to tweak or make some major changes as you go along. What you think might be good now, you might have a different opinion of later down the road. But if at least for your core subjects, you can pre-divide the learning to be done during the year, this will make things smoother during the year as you’ll have a guide of where you need to be and when. In regards to planning, I highly recommend the online planner: Homeschool Planet. It’s not an affiliate link or anything, just something I found very helpful. If you don’t like the idea of an online planner, and want to go pen and paper, here is my suggestion. Life happens and if you write your whole schedule out in an agenda or something, you’re going to be doing a lot of erasing and rewriting. Another idea would be to write / type out what you want to accomplish each day on a separate paper, listed by # of day. A traditional school year is about 180 days. So having a paper that has what you want to do for a subject for each of the 180 days will be ideal. This will help guide you in setting a pace, but won’t be unrealistically rigid. You can use this master plan to write your schedule in your agenda each week. This will limit the need for constant erasing, and will allow you the freedom for your homeschooling plans to evolve as you go along. With a schedule & plan in place, now you can relax. Allow flexibility. As homeschoolers you set the rules and no need to follow the same schedule as public school. If you want to take vacations during the low season and do school work during a typical holiday, then that is your prerogative. If your child wants to do a fun event on a day that you planned to do schoolwork, well there’s no reason they can’t get their schoolwork done at a non traditional time even if they’re doing it on a Saturday afternoon. This will be somewhat different depending on where you live. Some area’s allow complete homeschool freedom, and other’s require that your child learns equivalent to what is taught in school. So the first step is to know the homeschooling laws in your area. Generally tho, in Grade 1 you’ll want to place a heavy focus on learning to read, english (which includes reading comprehension, grammar, phonics, writing, etc.) handwriting, spelling and also make sure to include math. Those are the core subjects. Handwriting, while usually included to some degree in most Grade 1 english curriculum’s, needs to have more of a strong presence, in my opinion. When I originally planned my daughter’s Grade 1 year, I neglected to plan any special focus on handwriting but if I had to do it over, it would be an almost daily core subject. Better for them to learn this correctly, from the beginning, as this will save a lot of time down the road when they are continually expected to be able to write increasingly larger amounts of text. For curriculum that combines handwriting and spelling, see “Grade 1 Spelling Workbook“. In the first grade, the challenge of teaching your child to use a proper pencil grip is not to be underestimated. The struggle is real haha. And if I was given a nickel every time I erased a backwards 2, 3, 5, 7 or P, I mean 9, I’d have a nice chunk of change. Art is also a great subject to include in your homeschooler’s schedule. Music as well can be a great option. I’d love to suggest looking into Hoffman Academy as a music curriculum. Again not an affiliate link, just a great option to look into. It’s technically to learn piano but it’s more than just piano lessons, it teaches music. Video lessons are all free, but you can upgrade to be a premium member if you choose which gives various benefits like games, worksheets, piano sheets, practice tracks, etc. I can’t say enough good things about it. My daughter absolutely loves it and is getting a great musical education. See my complete review of Hoffman Academy. Some people choose to include cursive writing in their child’s schedule. If you’re religious, you might wish to include some sort of regular instruction. Not to be forgotten is some sort of regular chores or Home-Ec instruction. A foreign language might also be a good possibility. I have seen some include subjects like Geography, Science, History, etc. I have mixed feelings on this. Grade 1 is a year of firsts. There’s so much for a Grade 1 student to learn, mostly all from the beginning. They have to learn the alphabet, begin to read, how to hold a pencil, form their letters, the first time they are no doubt learning about nouns and verbs, fractions and bar graphs. There’s just so much already. I would be a bit cautious when adding other heavier subjects. Unless you can make it more casual, light, and fun, my opinion is to rather focus first grade on giving them a great foundation in reading and writing and teaching them to love learning. Having these basic skills will help make learning these other important subjects in future years much easier and smoother. Lastly I would recommend finding any local homeschooling communities. 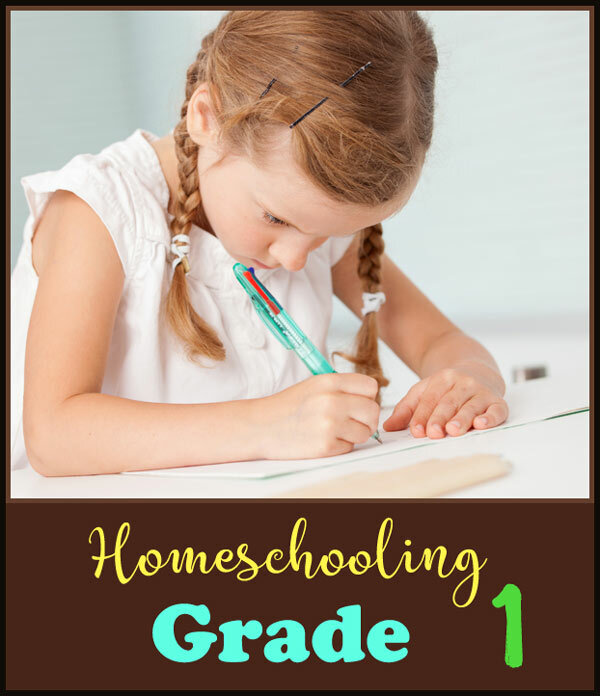 Usually there are many fun learning opportunities and events taking place throughout each homeschooling year. Libraries as well and your local community are often a source of fun educational activities. You can enrich your child’s Grade 1 year by mixing some of these activities in your regular schedule.